Use an area rug in a large room. Your only limits here are the feel that you're trying to achieve. Looking to visually separate a set of furniture? Consider a rug large enough so that just the front legs of your furniture sit on the rug. Or perhaps you want to define a larger space, there's no reason you can't have the rug extend past all the furniture. Either way we recommend you figure out your furniture placement first, then buy a rug that fits that space. Use an area rug to add a splash of color. 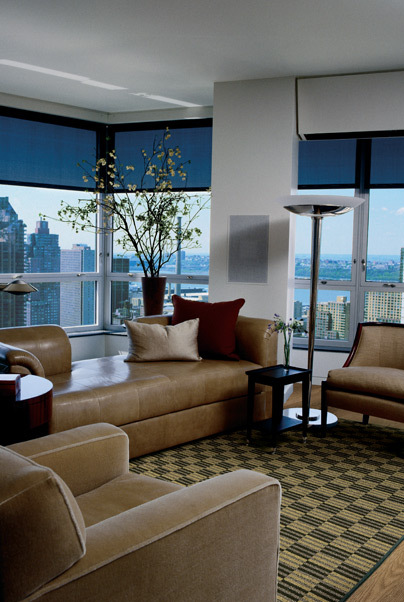 In a room large or small you could use an area rug in between furniture to introduce a bold pattern or color. This is a fun way to decorate a room and make a big impact with a relatively small piece. Use an area rug as the primary floor covering. 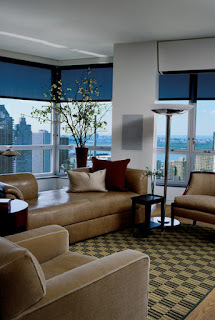 The standard rule of thumb for placing a large area rug is to leave 18 inches around the rug. That way you have some space between the walls and the rug but still use the rug as your primary floor covering. It's a good rule for balance, but don't worry if it doesn't quite work in your space. Leaving any sort of even border around the edges will probably accomplish what you want. Use an area rug in your bedroom. You have a couple of options here. Some people like to have runners on the sides of their bed. Or you could place a rug under the bed - just be sure that it extends a few feet out on the sides and foot of the bed to make the most of your rug choice. Use an area rug in the dining room. For balance we recommend you consider two options in the dining room. Either a large rug that follows the "primary floor covering" note above. Or a rug large enough to extend two feet out from the table, that way you have enough room for all of your chairs to comfortably be used. Use an area rug on a walkway. One of the most common uses of an area rug is in a hallway. The only rule of thumb here is to make sure the rug covers the primary walking area. Now is the perfect time to buy an area rug. It's National Karastan Month! Come in today and enjoy the lowest prices of the season on Karastan Carpets and Rugs from September 26 - November 6, 2012. While these guidelines are helpful - remember they are just that, guides. Feel free to mix it up! Use two area rugs in the same room. Place one side's furniture with all legs on and the other with just the front legs on the rug. Area rugs are versatile enough to fit any room situation. Still wondering how to use that area rug? Stop by Kermans showroom in Castleton and ask to speak to one of our designers. Their services are free and their advice is priceless.